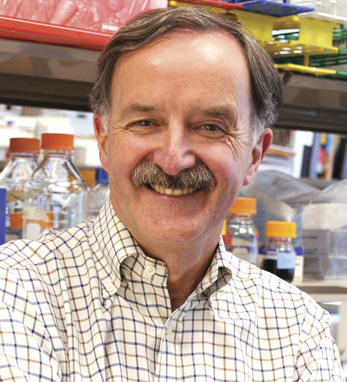 Dr. Garret FitzGerald is the McNeil Professor in Translational Medicine and Therapeutics at the University of Pennsylvania in Philadelphia, where he chairs the Department of Pharmacology and directs the Institute for Translational Medicine and Therapeutics. FitzGerald’s research has been characterized by an integrative approach to elucidating the mechanisms of drug action, drawing on work in cells, model organisms, and humans. His work contributed substantially to the development of low-dose aspirin for cardioprotection. FitzGerald’s group was the first to predict and then mechanistically explain the cardiovascular hazard from NSAIDs. He has also discovered many products of lipid peroxidation and established their utility as indices of oxidant stress in vivo. His laboratory was the first to discover a molecular clock in the cardiovascular system and has studied the importance of peripheral clocks in the regulation of cardiovascular and metabolic function. FitzGerald has received the Boyle, Coakley, Harvey, and St. Patrick’s Day medals, the Lucian, Scheele, and Hunter Awards, and the Cameron, Taylor, Herz, Lefoulon-Delalande, and Schott- stein Prizes. He is a member of the Institute of Medicine and a Fellow of the American Academy of the Arts and Sciences and of the Royal Society. In 2014, he was the inaugural Healthcare and Life Sciences 50 Keynote Speaker.